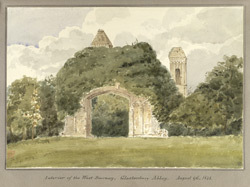 View of a west doorway at Glastonbury Abbey in Somerset. Glastonbury Abbey was one of the largest and the most wealthy of English medieval abbeys. Its income as a landowner was similar to that of Westminster Abbey. It was also famed as the burial place of King Arthur and inspired many other legends. There was a long established monastic community here since Anglo-Saxon times. In 1184, after a disastrous fire, the abbey church was started to be rebuilt,a process which would take several hundred years. It was rebuilt in the Norman Romanesque and early Gothic style. The life of this powerful institution came to am abrupt end when it was dissolved in 1539, when the Abbot was executed on nearby Glastonbury Tor. Afterwards it became a atmospheric and inspiring ruin.